Since 1989, Stanley M. Bergman has been Chairman of the Board and CEO of Henry Schein, Inc., a Fortune 500® company and the world’s largest provider of health care products and services to office-based dental, animal health and medical practitioners, with more than 16,000 Team Schein Members and operations or affiliates in 25 countries. The Company’s 2013 sales reached a record $9.6 billion. Henry Schein has been a Fortune World’s Most Admired company for 13 consecutive years and is ranked #1 in its industry on Fortune’s 2014 World’s Most Admired Companies List. Mr. Bergman serves as a board member or advisor for numerous institutions including New York University College of Dentistry; the University of Pennsylvania School of Dental Medicine; the Columbia University Medical Center; Hebrew University; Tel Aviv University; the University of Witwatersrand Fund; World Economic Forum’s Health Care Governors; the Forsyth Institute; the Business Council for International Understanding; and the Metropolitan Opera. Mr. Bergman is an honorary member of the American Dental Association and the Alpha Omega Dental Fraternity. His awards include being the recipient of the Ellis Island Medal of Honor; the CR Magazine Corporate Responsibility Lifetime Achievement Award; a Doctor of Humane Letters from A.T. Still University’s Arizona School of Dentistry and Oral Health; and Honorary Fellowship of King’s College London. WGNA is partnering with the NYS Dental Foundation and NYS Dental Association to trade out the bad candy for the good in our Trick or Retreat Friday morning on the Sean and Richie Show! Simply stop by our studio at 1241 Kings Road in Schenectady between 6 a.m. and 8 a.m. with the candy you don’t want and we’ll trade you some Snickers, M&Ms, Milky Way bars, Oreo cookies and more. The NYS Dental Foundation will also be giving away toothbrushes so you and your kids don’t get cavities after the candy bags run out. 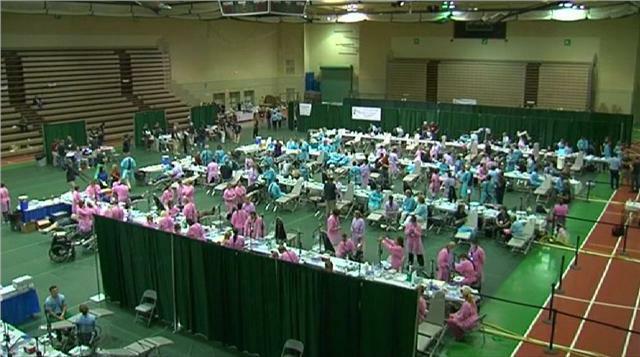 A dentist will be here to promote the foundation’s Mission of Mercy, a fundraising effort to support providing dental care to underserved populations. Come trade in your candy and learn more from 6 a.m.-8 a.m. on Nov. 1 at 1241 Kings Road.